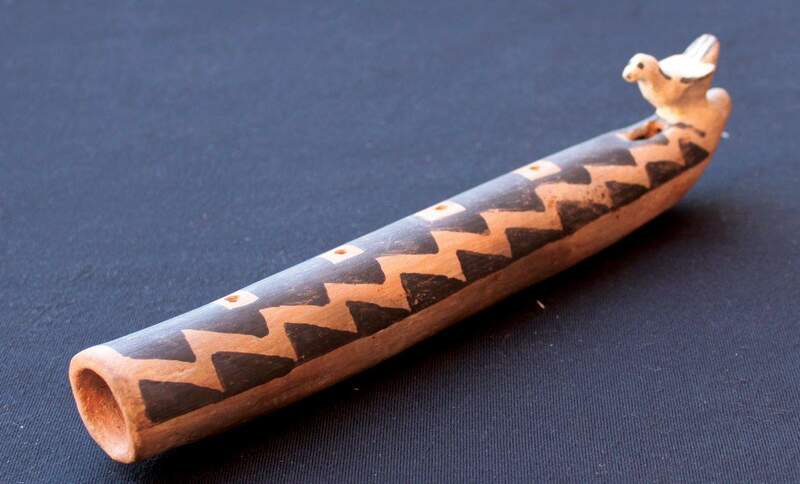 A rare treasure in the Richard and Eve Lynn Perkins collection is this pristine Pueblo III clay flute with a small bird at the flutes tip. The archaeological repository wing of the Edge of the Cedars Museum contains state of the art humidity, temperature and security systems so collections from federal lands can be stored close to where they were found. This story pot is a small black-on-white olla with a dramatic painting of an archer pursuing a mythical bird. 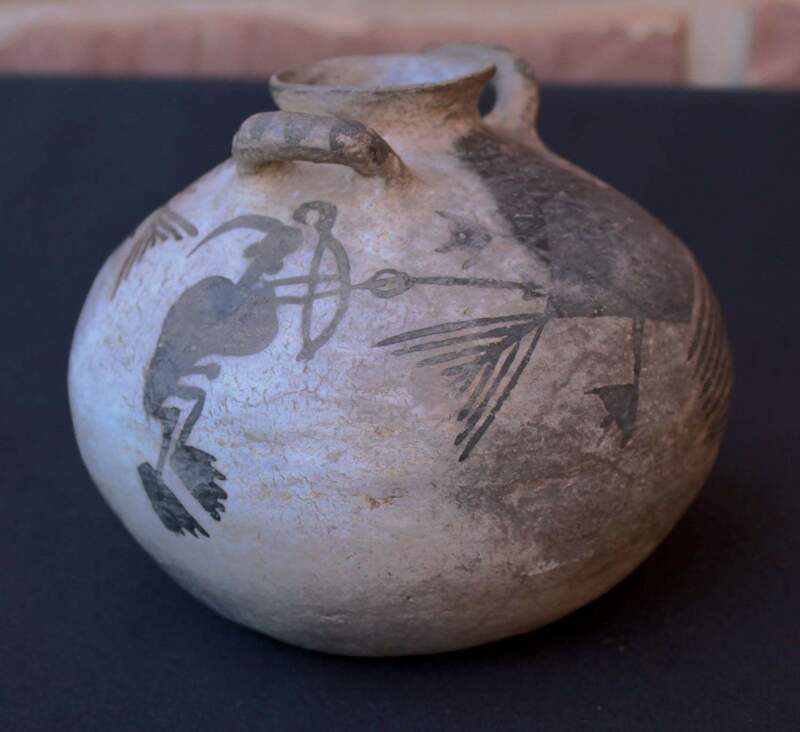 Ancestral Puebloan people crafted everyday ceramic ware for cooking, but they also added whimsical touches such as these pitchers with animal heads. Note the black dog figurine. Descendants of original Mormon settlers to Blanding urged preservation of this ruin at the Edge of the Cedars museum. 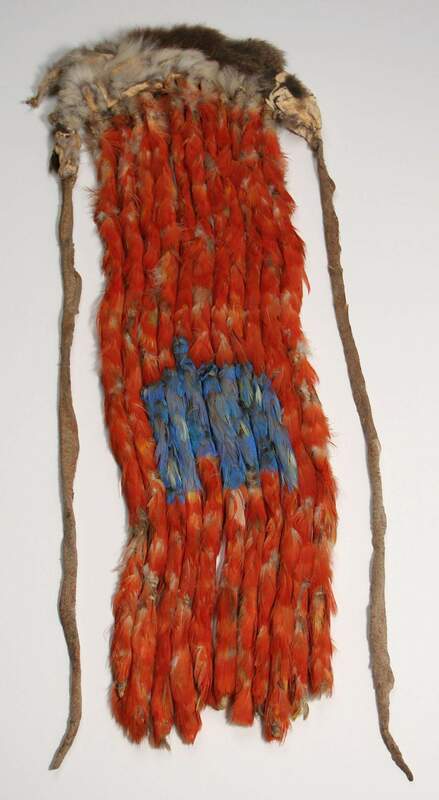 One of the rarest of all Southwest prehistoric artifacts, this macaw feather sash contains scarlet and iridescent blue parrot feathers from a species endemic to equatorial Mexico. BLANDING, Utah  Trust is critical in any relationship but especially between a museum and its donors. It takes years to build those ties. 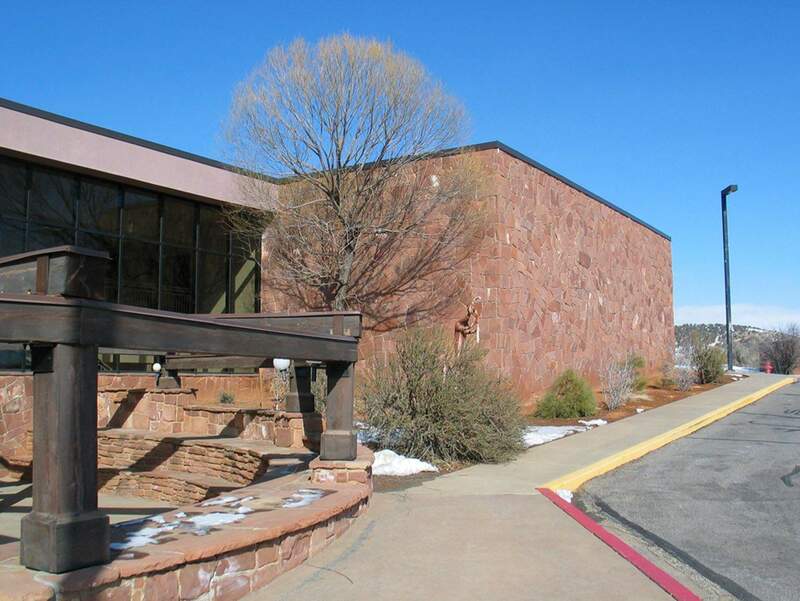 After decades of working with locals and federal agencies in southeastern Utah, the Edge of the Cedars State Park & Museum in Blanding has become a premiere institution for collecting, preserving and interpreting the prehistoric ancestral Puebloan presence. So it came as a shock last month when the Utah Legislature suggested that the states heritage museums might be closed because of budget woes. One of those museums is Edge of the Cedars. As a former museum director, I know how hard it is to run a museum  to pay the utility bills, to hire and train professional staff, to constantly be writing grants and to host a variety of annual public programs. Its a job that never ends at 5 p.m. I have respect for all museum staff in the Four Corners and particularly for staff at Edge of the Cedars. Not only do they administer an archaeological site, they have achieved the highest standards possible for a museum in the Southwest as a repository for federal archaeological collections from public lands. We want this standard because for a century, valuable artifacts from the Southwest left our area for the basements and storage shelves of the Peabody Museum at Harvard and the Smithsonian Institution; once I searched for prehistoric ceramics from southwestern New Mexico and found them in a room at the National Museum of Natural History. I had to wear a face mask and sign a health waiver because asbestos fell from the ceiling like loose confetti. The bowls rested in wooden cabinets swollen shut because of Washington, D.C.s humidity. Trying to open the drawers, I heard the sound of thousand-year-old Mimbres bowls scrape against one another as I tugged harder on the brass handles. The Southwest is proud of its prehistoric past. Uppity Durango women had Gustaf Nordenskiold arrested for digging seven train car loads of artifacts from Mesa Verde before it became a national park. But a judge determined that Nordenskiold had broken no laws. He was released, and his artifact horde traveled to Finland, where it remains to this day. Upset and outraged, Americans passed the Antiquities Act in 1906, making it illegal to dig Native American sites on public lands. Yet even after passage of the law, collections routinely left the Southwest to be buried in the bowels of Eastern museums. Strongly supported by locals in Blanding and San Juan County and visited by tourists from around the world, Edge of the Cedars has world-class collections on display and publicly accessible. Where else can you see the only macaw feather sash ever discovered in the Southwest? Or how about a unique beaver tail rattle or an ancient Basketmaker necklace made from shiny insect legs? Many of us who hike the backcountry have seen petroglyphs of crook-necked canes. Edge of the Cedars has a cane on display along with ancient sandals and turkey feather blankets. No, you cant just close a state museum that stores pot-hunted collections stolen from Bureau of Land Management lands and recovered by special investigators. By definition, a federal repository must have a professional staff, mandatory heating, cooling, humidity controls, fire-suppression systems and tight security procedures. Yes, such a facility has inherent expenses, but Utahs residents want Utah artifacts kept close to the canyons where they were found. He said that family members werent looking for artifacts, but over the years ceramic pieces worked out of the ground. My favorite one is a figure of a man with a bow and arrow and a long bird, the rancher told me at his home in Blanding. The collection is significant to Edge of the Cedars Museum in that it enhances the museums relatively small collections of late Puebloan pottery, and it contains good examples of ceramics from northwest New Mexico and northeast Arizona, said Curator Deborah Westfall. Those items must have been traded into Montezuma Creek during the Pueblo III phase, A.D. 1150-1250. A few items date to Pueblo IV, or A.D. 1324-1600. Perkins confirmed his familys intentions. Yes, its a tight time financially. Some Utah State Parks employees may be furloughed, and budgets may be reduced. But storing and exhibiting prehistoric collections is a sacred trust that must transcend temporary financial troubles. 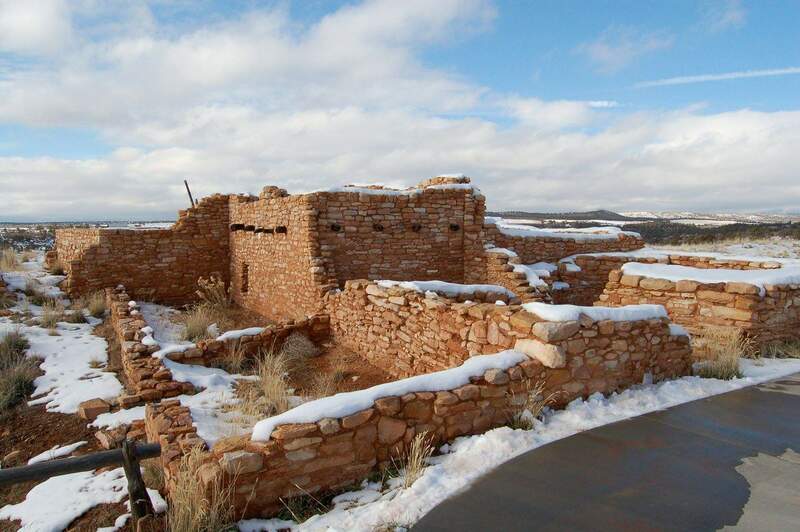 We owe that much to the ancestral Puebloans and to their descendants, and to our children, who need to know the prehistory of this special place we call home. Thank you, Richard and Eve Lynn Perkins for your generous donation. 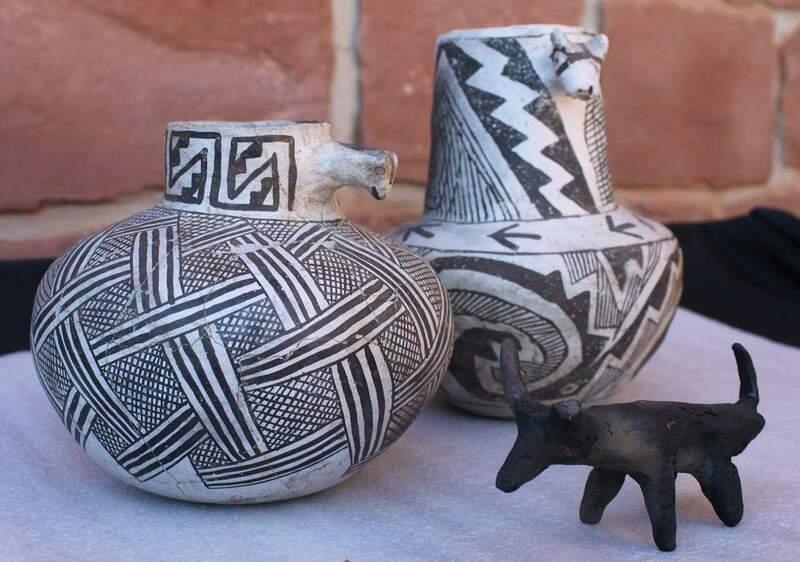 I cant wait to return to Blanding to see those whimsical Puebloan ceramics on display. And thank you to the Utah Legislature for, at least in the near future, honoring its obligation to keep open the Edge of the Cedars State Park & Museum. Its an essential facility for the past and for the future.